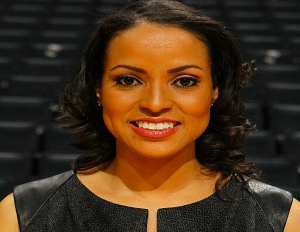 FOX Sports Southeast has announced that Stephanie Ready will be moving from sideline reporter for the Charlotte Hornets to game analyst, alongside Dell Curry and Eric Collins. While other women, including Ann Meyers and Nancy Lieberman, have served as occasional analysts for the NBA, Ready will be the league’s first full-time female analyst. Ready grew up in the suburbs of Maryland and attended Coppin State University in Baltimore, where she played on the women’s basketball team and later helped with recruiting and coaching for the men’s team. Afterwards, she moved to the NBA Development League and worked as an assistant coach for the Greenville Groove in South Carolina, until the team folded. After doing a bit of broadcasting and sending her tapes to ESPN, Ready received a call to broadcast for women’s sports. That work led her to eventually get into men’s sports and link with Bob Johnson’s new team in Charlotte, to do local reporting there. Working as a sideline reporter and host of Hornets Live, this will be Ready’s 12th season with Charlotte, except this time she will have a full-time seat at the analyst booth. “Even though I’ve done it all these years – some college games and some NBA games on a fill-in basis – this will be the first time I get to focus primarily on the job that I love the most in television. I couldn’t be more excited,” she said.